The UT women’s basketball team is gearing up for the 2017-2018 campaign, building off of a fifth-place finish in the Sunshine State Conference (SSC) with a 17-11 record, and an 11-7 conference record last season. The Spartans have seven new additions to this year’s team to help this year’s team, made up of five transfers and two incoming freshman. Although the two freshman will have to adjust to moving up a level on the court, they’re both Florida natives, who have the advantage of already having familiarity with the area, especially for freshman guard Julia Ingram, a Clearwater native. Tom Jessee, head coach of women’s basketball recognizes that it’s rare that an incoming freshman makes a significant impact at this level, but sees Ingram wasting no time making her presence felt, he said. “It’s hard for a freshman to make the jump into being a big contributor, but I do expect freshman guard Julia Ingram to compete for playing time right away,” Jessee said. 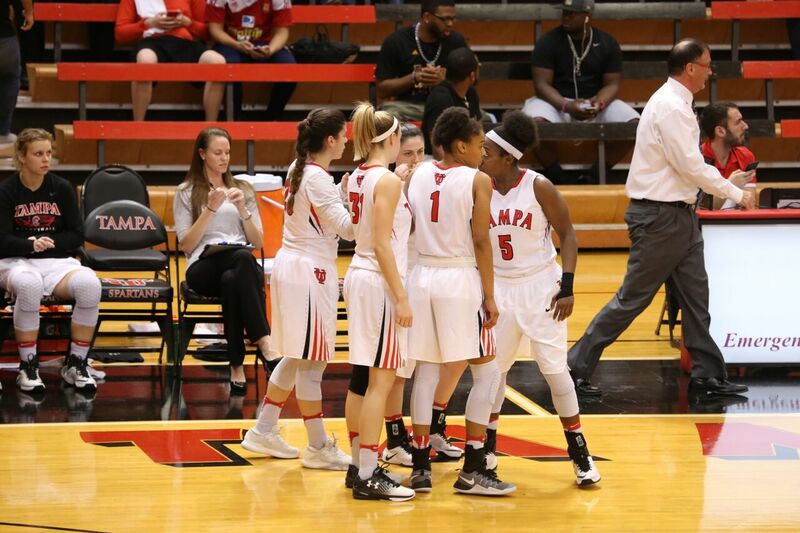 Ingram had an extremely successful high school career at Palm Harbor University high school according to coach Jessee, compiling over 2,000 points in her career, and averaging 25 points-per-game in her senior season. Ingram spoke on how she intends to help the Spartans improve in her freshman campaign. “On the court I will contribute in any way i can to help our team succeed,” said Ingram. “Weather its 3 point shooting, attacking the rim to get to the free throw line, or passing to the open man so that we can get an easy bucket.” Ingram clearly has an understanding that in order to give the Spartans a boost she’ll have to take advantage of the multiple gifts she possesses on the court. Ingram provided some insight into the upcoming preseason workouts she and her new teammates begin to get acclimated with one another. “During the preseason, as our coaches work us in conditioning, we will challenge each other and build our chemistry through hard work, so that come game time we have the trust and commitment necessary to achieve our goals as a team,” said Ingram. The second freshman, Marcella Benner, brings plenty of winning experience to the team. She became the star player at Newsome High School, where she played for four years and earned fifteen letters in that time. She was a force to be reckoned with on the court, but Benner was also a stellar cross country and track athlete, according to coach Jessee. The team’s assistant coach Caitlyn Mitryk said that she trusts Benner will be a quick learner, as she was also a fantastic student in high school on top of her athletic success. “She takes her studies very seriously and adds to our culture of maintaining highly competitive students not just on the court, but in the classroom as well,” Mitryk said. Benner received plenty of academic awards in high school including the National AP scholar award, and an AP Scholar with Honor and Distinction award. Ingram and Benner are complemented by the Spartan’s five incoming transfers, consisting of players making the move from various Division I schools across America. The youngest member of the five transfers is sophomore guard Aliyah Abney, a Charleston Southern University transfer. Abney averaged 2.9 points and 1.4 rebounds per game in her freshman campaign last season. She scored a career high of 11 points December 19. Jessee fully expects Abney to make an impact immediately, having a great ability to make plays for herself and her teammates with attacking the rim. Another transfer at the guard position, junior Emily Eshoo, comes to UT from Bradley University. As a sophomore, she appeared in 23 games and started in two for Bradley, averaging 2.7 points and one rebound a game. Jessee describes Eshoo as a talented combo guard, with the ability to play the 1, 2, or 3, bringing plenty of versatility to the team. She also brings an incredible boost to the squad from an intangible perspective, possessing a high IQ and always playing with a high motor. Shifting to the front court, the next transfer is Lauren Kotey, a 6-foot-3-inch junior center. Kotey played for the Division I program at Saint Joseph’s College for her first two collegiate seasons. Shooting at 56 percent, Kotey averaged 5.3 points-per-game and 4 rebounds a game last season. The Spartans will benefit from Kotey’s arrival greatly, as the center position was an area of glaring weakness for the Spartans last year due to some key injuries. Particularly, Northern Kentucky transfer and junior Center Molly Franson, who sat out all season as a medical redshirt last season. Jessee lauded Kotey, stating that she does a tremendous job at using her length at both ends, and has an ability to score in the post with a formidable face up and back to the basket game. Julia McClure, a junior guard and forward transferring from Wagner College, comes in as the most versatile player among the transfers. McClure can play all five positions, and be an unsung hero of the team, showing extreme production on the court that may not always show up in the stat sheet. McClure started all but one game last year at Wagner College. She tallied a season total of 70 assists and 25 steals, and reached double figure points in 10 games, with a season high of 16 points on December 12 vs Albany. Staja Tyghter is the final transfer of the group, taking just a short trip down south from Georgia State University. She comes in as the highest scorer among the five transfers, averaging 8 points and 4.2 rebounds a game. Tyghter had a memorable game vs Louisiana Monroe, scoring 22 points. She scored double figures in 10 games, and grabbed at least 8 rebounds in three games. Tyghter has a unique advantage that comes along with transferring to UT. She’s a former teammate of Spartans All SSC second team selectee and senior guard Karma Jeremie at Colonial High School in Orlando, FL. Tyghter and Jeremie’s familiarity and continuity with one another on the court will be a huge plus for head coach Jessee and his team as they both reunite as teammates once again. Jeremie’s experience will serve as a huge help for Tyghter as she adjusts to her new athletic and academic environment. It’s no easy task to fluidly add several new pieces, all from different college programs or high schools. However, with all these players bringing special talent and exemplary intangibles to the table, expect this year’s team to be one of the more exciting at UT and more importantly, expect them to compete for the SSC championship.